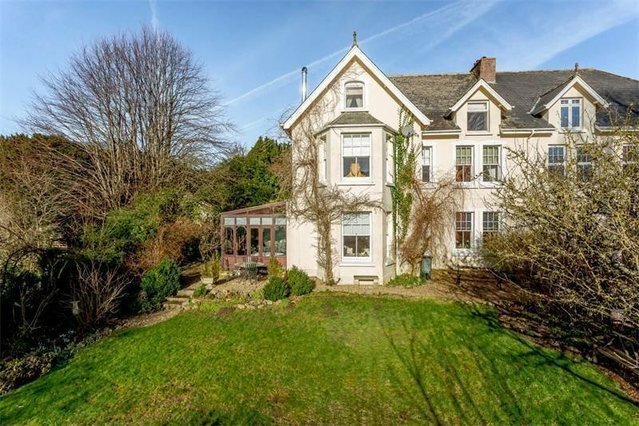 An attractive Edwardian house with over 3,400 sq. ft. of living space, situated on the outskirts of Chagford. Northfield was built in 1910 and has been in the same family ever since. The current owners have sympathetically updated the property and created a beautiful family home, maintaining the original period features. All of the rooms are spacious and light, with high ceilings and large windows. On the ground floor there is an entrance porch, entrance hall, boot room, a drawing room with a beautiful stone fireplace, a conservatory and an open plan kitchen/family/dining room. The stylish Smallbone kitchen features a Britannia range, granite surfaces, integrated appliances and a central island with a solid granite surface. On the first floor is the master bedroom, three further bedrooms, a family bathroom and a separate cloakroom. The south-facing master bedroom has a bay window, a bespoke Strachan wardrobe and an ensuite bathroom with a Matki walk-in shower. There are four double bedrooms on the second floor, plus a family shower room, again with a Matki walk-in shower. Northfield is approached through double gates into a gravelled parking and turning area to the front of the property, which leads to a double garage and the gardens. A paved terrace, ideal for ’al fresco’ dining and entertaining, lies to the rear of the property and is accessed from the conservatory and rear hall. The beautiful south-facing gardens are bordered by fencing, established hedging and trees, providing a secluded and private space which backs onto a field. A lawned patch of garden off the terrace leads through an arch to the productive vegetable garden with apple, plum and pear trees. A summerhouse and greenhouse are found here, both with electricity connected. The outbuildings lie to the side of the house and comprise three storerooms, a laundry room and a gardeners WC.